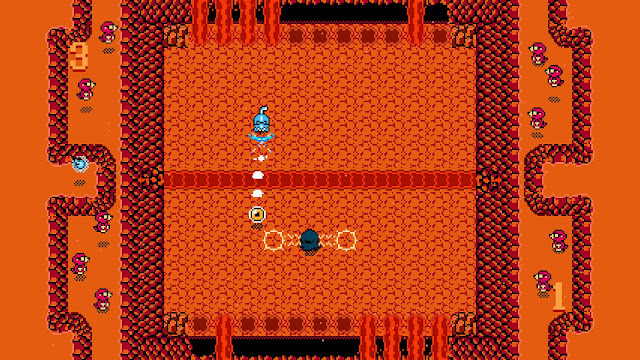 A Legend of Zelda fangame to a T, SpiritSphere is a small local multiplayer title developed by one man studio Eendhoorn Games (on a tablet!) which remixes old school NES adventure game sensibilities with all the craziness of air hockey. In SpiritSphere, the goal is to knock a magical orb into your opponent’s goal with a variety of attacks and special abilities, while defending your own goalposts. The focus here is on couch local multiplayer with easily understandable gameplay which leads to lightning fast competitive matches. The overall flow of the game is easy to read and feels great. Character movement is smooth, sprites are distinct and recognisable, and most importantly the collision detection is precise to allow for player skill. SpiritSphere plays just like air hockey or pong, where each player has access to a character who must try to knock a ball into the end of the opponents’ side of the screen. Each character has a basic attack, a special and a dodge roll, each of which affects the ball in various ways. The easiest way to explain this is with the character Lin, who is one letter away from everyone’s favourite green tunic wearing hero. Lin’s basic attack is a sword swing, his special is a spin attack which curves the ball, and his dodge roll moves him quickly across the field just like in his Link to the Past iteration. There are currently three different characters to play as, each with slightly different abilities and attack patterns. The ball also affects your game as well, with unlockable styles such as extra speed, larger size or multiball making every game a little different. 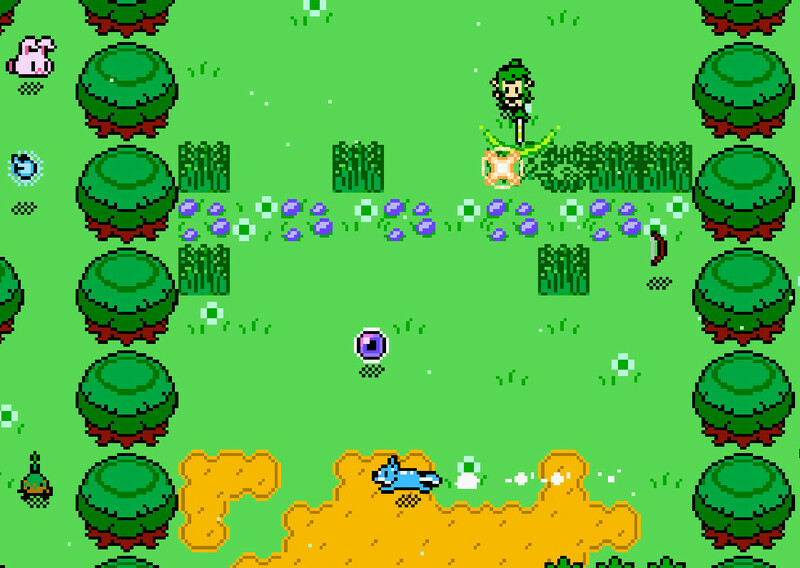 Eendhoorn Games skilfully uses the Legend of Zelda aesthetic which would be familiar to most players and reappropriates it to fit arcade style gameplay. Many will have fond memories of knocking back Ganondorf’s magic blasts with the empty bottle in Ocarina of Time, and SpiritSphere recreates that experience in 8 bit form. The graphics and music fit this era of design to a T, and will easily evoke some fond memories of the NES era. The Zelda influence is also reflected in the game’s various stages, featuring small details like grass that can be cut, gates that can be opened with stepping switches and skeletons which can be defeated to drop items. Stages are dynamic and feature elements that move or change depending on how you move your character. Furthermore, some stages have powerups which can be activated by picking them up as they spawn, which make small changes to your game such as allowing you to put up barriers or making your character size larger. The variance ensures that no two games are the same. Each stage is also adequately large so that players can make use of their dash to get across the map in a pinch. 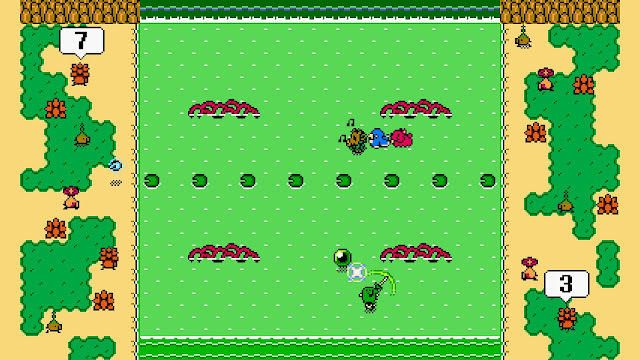 This makes the game fast paced but also quite skill based, with more experienced players being able to zip across the screen and use the precise collision detection to flick the ball off the tip of their sword and into the opponent’s goal. Unfortunately, a lot of the stages don’t yet have the grandeur of a Zelda boss battle. The levels are dynamic with a lot of moving components to them, but the reliance on small sized sprites means that duels don’t have the same spectacle as the boss battles from A Link to the Past or even the original NES Zelda. I would have loved for some of the ideas to be expanded upon and for the levels to be a bit less static, varying in both visual theme and gameplay. Similarly, I thought that after a while the three characters started feeling similar to each other, and there wasn’t enough to differentiate their gameplay styles. For this reason SpiritSphere’s unlock system hurts it more than it helps. By playing the single player campaign, players can earn coins which they toss into a fountain to randomly unlock more balls and stages to use. While I’m sure it’s intended to make the game feel longer and to slowly let players experience more and more of the content, I felt that it just makes the game feel more empty upon starting. Each subsequent unlocked stage and ball didn’t change the game that much, and the campaign stages featured competent AI but too much repetition to capture attention. For these reasons, SpiritSphere is a game which is fun, but hard to get excited about – good in small bursts, but not much lasting appeal. The multiplayer is where Eendhoorn Games expects you to spend most of your time though, and for good reason – SpiritSphere is a lot of fun to learn with friends. As you slowly notice yourself getting better and as you figure out the tricks of each stage, you’ll have more and more fun outsmarting your friends. There are little “outplay” moments built into a lot of the stages. Sometimes you can cut grass which would normally help the opponent block the ball, or you can use diagonals to bounce the ball in unconventional directions. These are moments when having someone to play against enriches the experience, and there’s a distinct guilty pleasure once you sink the ball into the opponent’s goal without them even noticing. The game supports two players on a keyboard or gamepads, both of which are great ways to get your friends to join in on the action. Despite its lack of content, SpiritSphere is still a blast for the first few rounds of play. If you’ve got friends who don’t have much time for a long haul multiplayer game, but still want some fast paced action, SpiritSphere has you covered. It’s an interesting look at how nostalgic and culturally significant footnotes in gaming can be remixed and reappropriated into completely new experiences. Fingers crossed that as it moves into full release it just picks up on the content side of things.